The UFC is heading to Denver this Saturday for a Fight Night card that includes four great fights. The UFC has a busy month of November with something going on every weekend, and this is the perfect card to follow up UFC 230. The Korean Zombie vs Yair Rodriguez headliner is sure to be a firefight, while Donald Cerrone vs Mike Perry is another couple fan favorites who like to throw down. Raquel Pennington vs Germaine de Randamie and Joseph Benavidez vs Ray Borg are the other two marquee match-ups on the card. This card will take place on Saturday with the early prelims beginning at 6:30pm EST on Fight Pass. 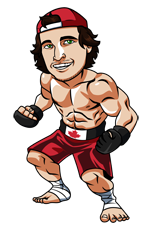 The 8pm prelims will be broadcast here in Canada on the Fight Network, and main card will move to TSN5 at 10pm EST. This is going to be a firefight. Both of these guys have flashy striking and I expect this to be a kick boxing fight. Sung Jung also has slick submission skills so if he is losing the stand-up battle he may look to turn this into a grappling contest. That said, I think Yair is the younger and more explosive fighter in this match. Yes, he was destroyed by Frankie Edgar in his last time out, but that was a huge jump in competition and I think he could have made improvements in the last 1.5 years away from the octagon. Yair successfully avoided a fight with Zabit Magomedsharipov, which I think was a smart move to avoid a likely second loss, but I think he has a great shot at winning this one by keeping the fight standing and being the more explosive and elusive fighter on the feet. I do not think Cerrone deserves to be this big of an underdog in this fight. Yes, he’s 1-4 in his last 5 fights, but his losses were to top level welterweight fighters and I don’t think Mike Perry falls into that category. Perry is coming off a win over Paul Felder, where he squeaked out a split decision over a fighter that broke his arm early in the fight. Before that somewhat lucky break, Perry lost via decision to Max Griffin and Santiago Ponzinibbio. I think the book is out on Mike Perry’s stand up and I believe Cerrone has the skill set to take advantage so long as he doesn’t get too emotional in this fight. There is some bad blood in this fight between Cerrone and his old Jackson-Wink gym, which chose to train Mike Perry for this fight over him. Cerrone does not fight nearly as well when he is emotional and not 100% comfortable, so I do worry that Mike Perry will take advantage of this. That said, Cerrone is the more technical and skilled fighter. Perry is also not a big welterweight, which is something that’s given Cerrone problems in the past. Take Cowboy at the + money in this one. Play: Cerrone 2.87 @ Bet365.com ***These odds are correct at the time of this article, but they will likely change as the fight approaches. De Randamie is a great stand up fighter, but I’m not convinced she is going to be able to come out on top against a grinder like Raquel Pennington. De Randamie really only has a win over Holly Holm, a fellow striker, as her lone high level win in MMA. Pennington has wins over Miesha Tate, Jessica Andrade and is coming off a 5 round war with Amanda Nunes. I think Pennington is a smart and tactical enough fighter she will find a way to close the distance and make this a battle about who has more heart. I think the answer will be Pennington. Play: Pennington 2.50 @ Bet365.com ***These odds are correct at the time of this article, but they will likely change as the fight approaches. Benavidez didn’t have his best performance against Sergio Pettis in his return to the octagon, but he only lost a split decision. People act like he’s completely lost his ability. I disagree. I also believe this is a great matchup for Benavidez because he should be the better stand up fighter and I’m not convinced he won’t be the better grappler. Against Pettis he was slightly outmatched standing, and he couldn’t get the fight to the mat. In this one, I don’t think he will have to worry about forcing this fight to the mat and he should be content to compete wherever the fight takes him. Look for Benavidez to get this win and showcase that he’s still the elite level fighter he was back in 2016. Play: Benavidez 1.91 @ Bet365.com ***These odds are correct at the time of this article, but they will likely change as the fight approaches.